Twenty-Eighteen was a big year for us at Final Straw! We re-launched our rag-tag media production collaborative, and we’re now called City as Nature. We’ll be releasing new Final Straw-related short films, and hosting eco art exhibitions in Seoul and Paris this year, and will continue our other media works, syndicated widely through our partners. To kick things off in 2019, we released a special 20-minute version of the Final Straw: Food, Earth Happiness documentary for free (read on for the link). One of our main goals in 2018 was to build a physical space where we could bring together people to put into practice concepts from the Final Straw film in an urban context. 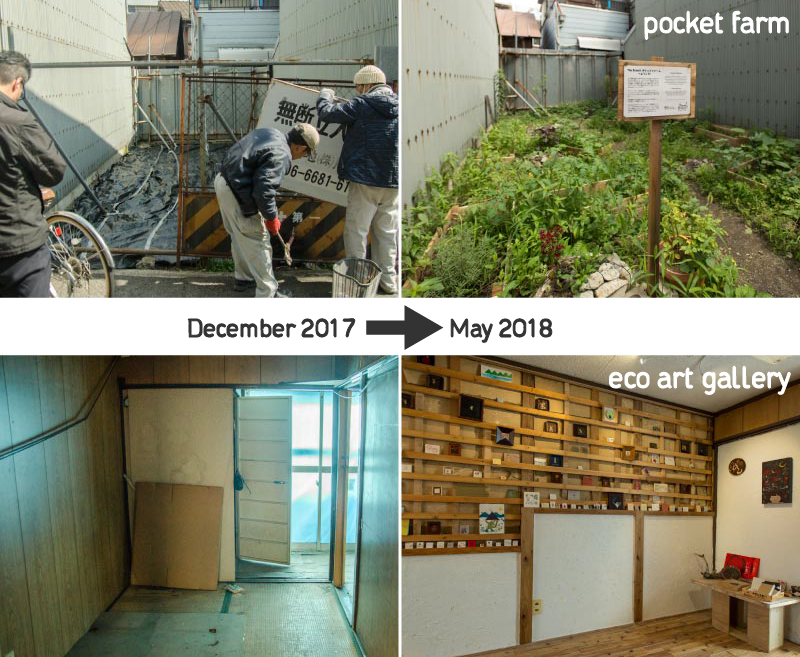 Over the course of the year, we did this by transforming an old house in Osaka into a physical space for ecological art, media, and community activity. That space, affectionately called The Branch, quickly became hub of activity. You can see stories and images of the amazing transformation in The Branch: Before & After. Whether you donated, watched our documentary, attended a workshop or exhibition, or just sent a friendly hello to us, we want to share our thanks. All of it made a difference. Our Final Straw: Food, Earth, Happiness documentary has been chosen as one of 25 Global Environmental Justice films, to be used in university courses throughout North America beginning in 2019. In the field, from starting independent farms and food co-ops, to quitting jobs and pursuing dreams, multiple individuals told us stories of how their perspectives and lives changed after attending one of our workshops, exhibitions, or screenings. To top it off, The Branch was awarded a special commendation by the Nick Reeves Award for Arts and Environment! We feel especially fortunate to have so many visitors and supporters from afar who believe in the value of what we are doing. To thank you, we have been going through footage and secretly working on a special ‘condensed’ version of our documentary. To close, as we promised at the beginning of this article, you can now watch this 20-minute special film, Food, Earth, Happiness for free at Films for Action and on our new YouTube channel. To be sure that the inspiration keeps coming to your screen, sign up for the City as Nature YouTube channel, and lastly, if we can’t eat, we can’t film, edit, write, or translate. This is a huge part of what we spend our time doing, and it’s done independently, without support from corporations or special interest groups. If you have the means, consider making a donation to help us keep producing this content.